I’d forgotten I’d taken this photo until I was scrolling through a few photos on my phone deciding whether to keep them or not. It caught me at a moment of feeling a bit hungry too, and really set my tummy rumbling, as I remembered how tasty it was. So much of the enjoyment of food is its appearance, the colours and textures and the presentation, and this scored highly on that measurement scale. 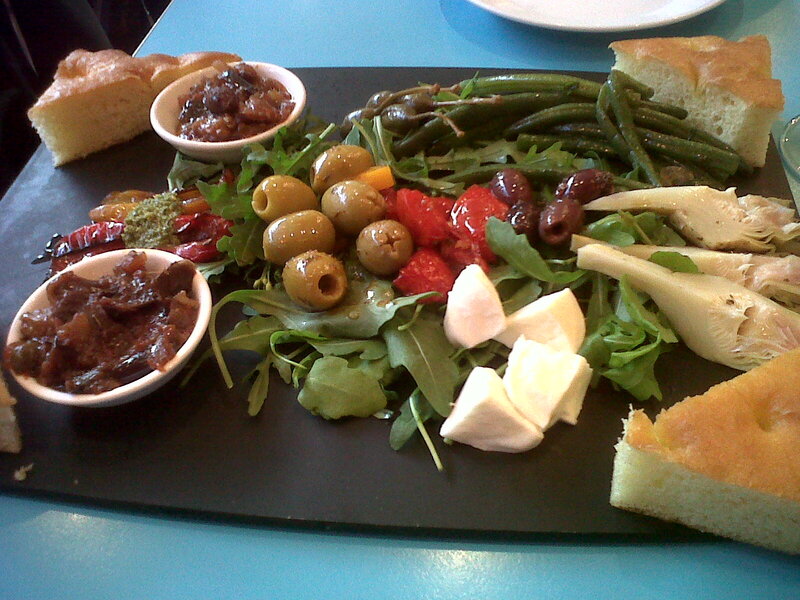 It’s the vegetable antipasti at Carluccio’s in the Brunswick Centre in London. My friend S and I shared it after we’d been to the Grayson Perry exhibition at the British Museum and before we went to see ‘The Deep Blue Sea’ at the cinema. The most striking thing about it is, however, that I seem to have turned into the person who takes photos of food in restaurants: the blog has done that. I’m not entirely sure that it’s such a good development. Although I’d forgotten about the photo, as soon as I saw it I remembered stopping S from digging in until I’d taken the shot. My excuse was that I never know when I can find a use for a random photo. And at that moment I understood that sometime in the last 11 months I have turned into a person that my friends expect might take a photo of restaurant food, which might at some point appear on the internet, at the drop of a hat. That is a very strange realisation indeed. It’s less unusual these days than you think — I recently had lunch with 8 friends, and as the food was brought to the table, every single one of us reached for our cameras! Within a very short time, photos of our menu choices were on facebook, I suspect long before the food itself had even had a chance to digest. You at least have the excuse of a daily blog, but I think the rest of us are just trying to make our friends jealous…. Haha Jill, the mental picture of that is fabulous. It’s now doubly true that food should be a feast for the eyes as well as the stomach! …or make our lives seem more interesting and fun-filled than they really are…. That can’t be true…… I hope you took photos of your friends as well as the food! Thanks. It was very tasty. The pictures in your posts look very tempting too. Hello Rowena, great photo… Wish I could reach into the screen and help myself. Hi Polly – thanks. Maybe that will be the next technological development…there is already something that ‘prints’ spare parts for machinery, we could build a food printer and hook it up to the fridge and microwave!